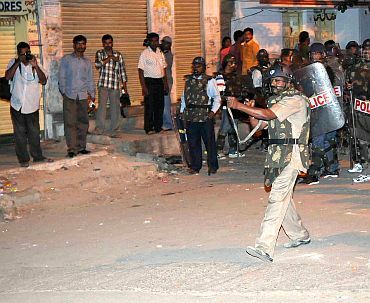 Osmania University campus in Hyderabad, which witnessed violent clashes between the police and the students till late Sunday night, remained tense on Monday. A large police contingent is closely monitoring the situation. At least 11 students and five media persons were injured in cane charge, and firing of tear gas shells and rubber bullets by the police. 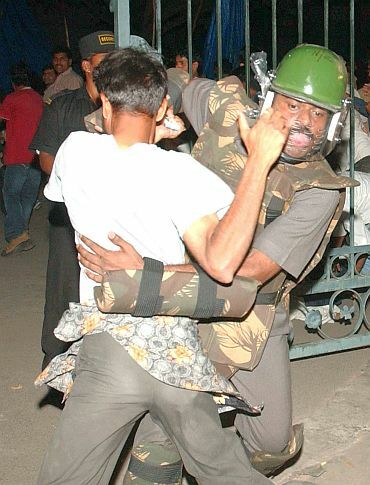 Seven policemen, including Additional Commissioner of Police T Krishna Raju, were injured in the stone pelting by the student. Hyderabad city Police Commissioner A K Khan said trouble started on the campus when students took out a procession from the campus, burnt an effigy of the central government and tried to break the police barricades at the gates of the campus. Khan said the students pushed the policemen. When the police forced them to retreat, students started pelting stones on the policemen injuring them and damaged two wheelers -- some of them belonging to students and journalists. But the students and journalists alleged that it was police who beat them up brutally and injured the journalists and damaged their cameras to stop them from covering the violence on the campus. The media persons injured in the violence include Harish of HMTV, Naga Raju of Z-24 TV, Rama Krishna of Eenadu, Ravi Varma of ETV and B Srinivas, MAHAA TV. All of them were admitted to the Gandhi Hospital. Five girls were among the 11 students injured. Among the injured policemen included a head constable and a constable of CRPF, one Greyhound commando, two police constables and a home guard. Prohibitory orders were in force on the campus as the University is the hotbed of the ongoing Telengana agitation in the state. 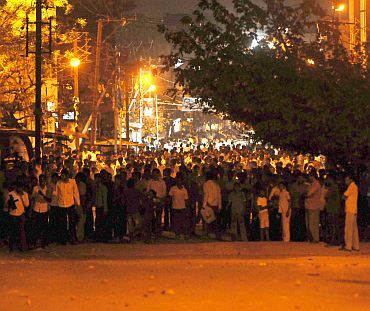 The Andhra Pradesh government on Sunday night ordered an inquiry into the baton-charge on students at the University. "The incident at OU is painful. I spoke with the DGP and Police Commissioner on the conditions that led to this incident and why cane-charge had to be done. 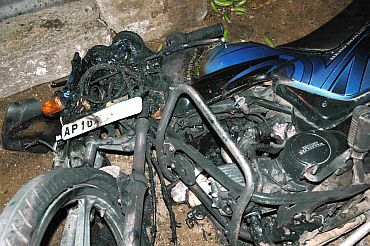 An inquiry has been ordered into the incident immediately," state Home Minister P Sabita Reddy said. Action will be taken if any officer is found to have committed any excess, she said. "The Centre has constituted a committee.That committee will definitely take into consideration the feelings of the region. Students should also be calm," she said.